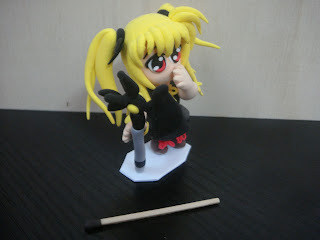 Yesterday I had posted about difference of 2011 & 2012 clay figure of Takamachi Nanoha, today I will post more about Magical Girl Lyrical Nanoha series figures I made. Don't you think she was cute? I just only had watched the first three episodes of season 1, so I'm not sure did I made Fate correctly or not, because some fan art wasn't follow her appearance. Blonde hair, Twintails and a pair of red eyes right? You can request for any character you like, I would try to mold it out.